What Is a Basal Knob? (noun) The basal knob is a very prominent bump, swelling, bulge, or projection at the base of a bird's bill, typically positioned on the upper mandible and extremely noticable. It usually has a bulbous, horn, or plate-like shape that projects away from the bird's forehead rather than staying flat along the head like a frontal shield, and is much more obvious than simply a wide bill base or sloped bill shape. While the exact purpose of basal knobs is unknown, they may serve as an indicator of health or sexual maturity, particularly during the mating season when some knobs become larger or may take on different colors with breeding plumage. These knobs can also be a good field mark for proper species identification, and in some cases, may be considered diagnostic markings. The overall size, shape, and prominence of the basal knob often varies by gender, with males typically having larger and more obvious knobs. In some species, females may not have basal knobs at all. After the mating season ends, basal knobs may remain the same or may dramatically reduce in size and become a more neutral, camouflaged color. Wattles: These fleshy nodules or bumps are usually much smaller than basal knobs and are typically found in groups, while the basal knob is a single structure. Wattles may also extend onto the lores or around the bird's eyes, but the basal knob does not. Snood: This long, dangling protuberance is only found on wild turkeys and ocellated turkeys, and is much longer, thinner, and more flexible than basal knobs. The snood can also change color, size, and shape with a turkey's emotion. Frontal Shield: This is a small, relatively flat plate that protects a bird's forehead, but it is not swollen and usually is not as large or prominent as a basal knob. Frontal shields can be slightly swollen, but without the extreme shape of the basal knob. Nares: These are a bird's nostrils, the holes on the bill that are used for breathing. While the nares may be slightly swollen with illness or injury, they are not basal knobs. The basal knob, on the other hand, has no holes. Cere: The cere is a fleshy, skin-like covering at the base of a bird's bill, but does not swell up to the same extent as a basal knob. The cere typically conforms to the shape of the bill, and may cover the nares as well. 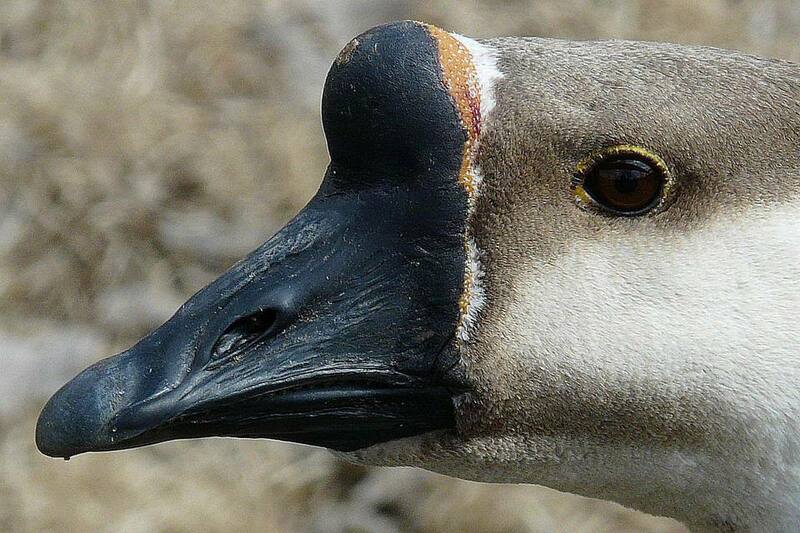 Nail: The nail is the stiff, swollen tip of the bill on many ducks and waterfowl, and is used for foraging. It is not at the base of the bill, and is not as large as a basal knob. On some birds, the nail can be a different color than the rest of the bill. Rictal Bristles: These are small, stiff feathers at the base of a bird's bill. While they are in the same place as the basal knob, they are feathers, not a bump or swelling. Rictal bristles are most common on different songbirds, particularly woodpeckers. Casque: This is a hard, horn-like plate that may be on top of a bird's bill. While the casque is very similar to a basal knob, it is positioned further down the bill and not near the forehead. Some birds will shed their casques after the breeding season ends. Basal knobs are found in several waterfowl species, including mute swans, comb ducks, black scoters, northern shelducks, king eiders, rhinocerous auklets, and the domestic Chinese goose and its hybrids. The size, shape, and color of the basal knob, as well as its proportions to the bird's bill size overall, can help with species identification, especially at distances where finer facial details may not be visible but the silhouette of the knob can be a good clue.